1. Start a Progress Developer Studio for OpenEdge session. 2. Run the ABL code specified below in Progress Developer Studio for OpenEdge. 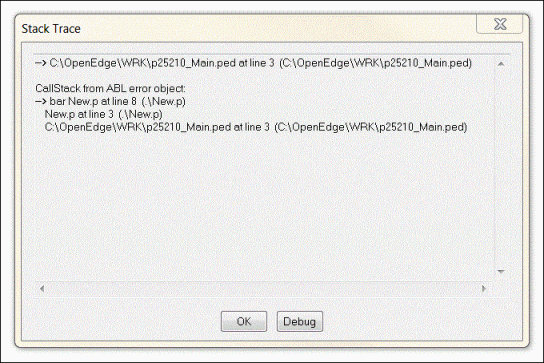 For more information, see Progress Developer Studio for OpenEdge Help. FIND CUSTOMER WHERE Name BEGINS "Z". 3. Compile the code and run it. 4. Click Help in the Error message box. The Stack Trace dialog box appears. It contains the ABL Stack Trace and displays the CallStack information under the heading "CallStack from ABL error object". The following figure shows a ABL Stack Trace dialog box with the ABL stack trace. Use the -clientlog startup parameter to enable the display of CallStack information in a log file. Each line of the trace gets prefixed by the standard log file line header. The following figure displays the appearance of CallStack information in a log file. For more information on the format of each stack line, see OpenEdge Development: ABL Reference.